The lifetime value of a customer is a number that helps companies focus their customer service activities. If you know how much that client is worth, you work harder. Evidently, Celebrity Cruise Lines has not taught all of their bar managers that number. Here is what happened on our recent cruise and then I will go over the numbers. We were part of a group traveling in the Western Caribbean on the Celebrity Reflection. Sharyn and I were along as a continuing education program that was offered for marketing. Each evening, the group was meeting in one of the lounges, prior to dinner. On the 3rd night of the cruise, two of our party brought some cheese and bread into the lounge from one of the cafés because they did not want to drink without eating something while they drank. An hour or so after we were drinking (spending money as a captive audience), an officer of the ship who identified himself as the Assistant Beverage Manager of The Ship, saw the two plates, told us that food was not allowed in the bar, and had a bus boy pick up the plates and take them away. We asked why. He said that it was against the rules. Yea, that did not make sense. Where is it posted? It is not. 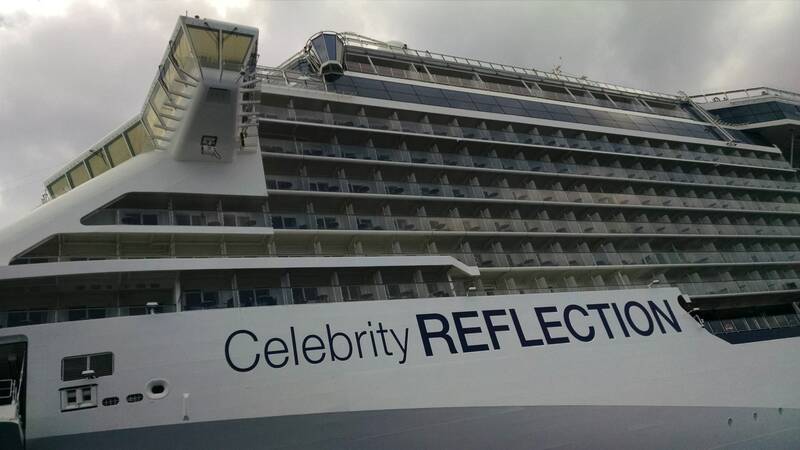 Where is that rule on the Celebritycruises.com website? Nowhere. Where was it in the all the materials they leave in your cabin each night selling your MORE stuff? Can’t find it. I was incensed. Those of you who know me just can’t believe that, right? I asked the manager: why did you have to embarrass the two men who brought it down? Why did you not just ask us not to bring food to that lounge again? Why did you waste the food? How are we supposed to know about these rules? What OTHER rules just exist that they don’t tell us about? And most importantly – WHY ARE YOU TREATING US LIKE 6-YEAR-OLDS WHEN WE JUST PAID A COMBINED $60,000 PLUS EXPENSES TO GIVE YOU A JOB? I could not leave it there. I went down to Guest Relations and asked to speak with the Hotel Manager. I did not expect him to be in (but I don’t know where he was going to go in the middle of the ocean) so I set a phone appointment time with him for the next morning. He missed the appointment. And did not call me or leave a message to let me KNOW he was going to miss our appointment. Through his assistant, I set an IN PERSON meeting at 6 pm for that evening in their office. At 6 pm, we showed up at the Hotel Manager’s office. I was told he was finishing up another meeting and would join us momentarily. It ALSO appeared that there were going to be several people in that meeting, one of whom was the Beverage Manager for the entire ship, Clint Kelu. He asked if we would like to begin on time, and I said that would be great. I laid out what had happened and when I told him that the service we received at that moment was more to be expected on Ca******* Cruise Line, he seemed to flinch slightly. I asked for the purpose of that rule. He answered that it was really put into effect because there are some foods which carry an odor which would not be in line with the theme of the bar. “But bread and cheese hardly seems like it would cause that unwanted effect,” he said. He apologized and explained that the officer in question had the option to not enforce that rule, he should have let it go. In fact, he was absolutely on board with our complaint and at no time did I feel he was just going through the motions. He took the names of the other members of our party and said that they would absolutely receive an apology. Taking the extra step, they also received a bottle of champagne. Two nights later, we saw Mr. Kelu at a Captain’s Reception. Not only did he instantly recognize us, but apologized again and made certain that everyone had heard from him. THAT is the mark of a company who sets a high bar and has the people in place to meet that standard. So how about that Lifetime Value number? We are Captain’s Club members of Celebrity. That means we have spent 40 nights on their cruise ships. Including their sister line Royal Caribbean, we have over 40 nights on board their ships. And just 2 hours before the incident I am writing about, we had booked a 9 night cruise in Europe to celebrate our 25th wedding anniversary. That’s almost $8,000. If you add another cruise at an average of $5,000-$7,000 per cruise every other year, in the next 20 years, we would spend $70,000 (not including money spent ON the ship for shore excursions, alcohol, wi-fi packages, etc.) during that time period in addition to the over $30,000 we have spent in the past on that line (plus extras). So, do you think that our cruise is going to stay on the Celebrity books? What do your clients spend with you? Are you training all your people on that number? If you would like help putting that number together, or a training program for you and your staff, give us a call: 800-705-4265. We will help you keep business on your books, where it belongs, and not sail away to one of your competitors.